Next up: Full Throttle. Right? 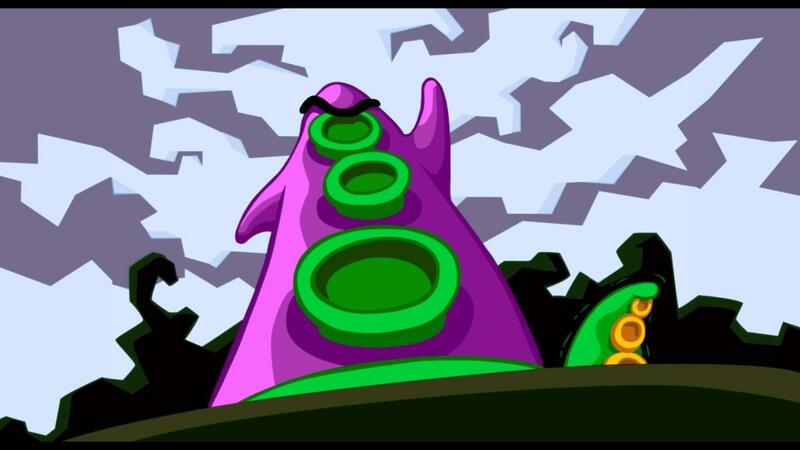 This week I played Day of the Tentacle legally. Those of you who played it back in 1993 understand why this is such a big deal. And the rest of you? If you’re wondering “Why would he start off a review with such a banal statement?” then blame LucasArts. See, Day of the Tentacle is the latest Double Fine re-release, following in the wake of last year’s Grim Fandango Remastered. Despite being a classic point-and-click—and many people’s favorite point-and-click of all time—it’s been pretty much impossible to buy Day of the Tentacle for the last fifteen or so years. And now you can. With spiffy new music and graphics, to boot. It’s enough to make you throw up your tiny purple tentacle arms and cheer. The sun is shining. The birds are chirping. And a purple tentacle creature named...Purple Tentacle...is drinking toxic sludge out of a river. The Lorax’s worst nightmare is Purple Tentacle’s coup de grace, a bit of nuclear-bolstered evolution that causes Purple Tentacle to grow arms. And as is the case for all creatures-with-arms, his next step is to try and take over the world. Three kids—a nerd named Bernard, a stoner named Hoagie, and a weird hippie named Laverne—are the only ones who can stop Purple Tentacle. Their plan? Travel back in time to yesterday and turn off Dr. Fred Edison’s sludge-making Sludge-O-Matic machine. Brilliant! If only Dr. Fred hadn’t built a vital part of his time machine out of discount diamonds! And so it happens that the machine breaks, everything goes horribly wrong, and the three kids are stranded in different eras—Laverne in the tentacle-ruled future, Hoagie in the American Revolution, and Bernard in the present. It’s goofy but clever, and serves as more than just a vehicle for jokes about George Washington’s teeth. Day of the Tentacle’s time travel is central to the game’s best puzzles, with the kids swapping items back and forth across time and occasionally setting up circumstances in the past so something changes in the future. At the risk of doling out 23-year-old spoilers I’ll abstain from laying out any of the puzzle solutions here, but imagine: You’re tired of the sun shining through your bedroom window every morning so you go back in time 100 years and plant a seed and when you go back to the future there’s a massive oak tree in front of your house. 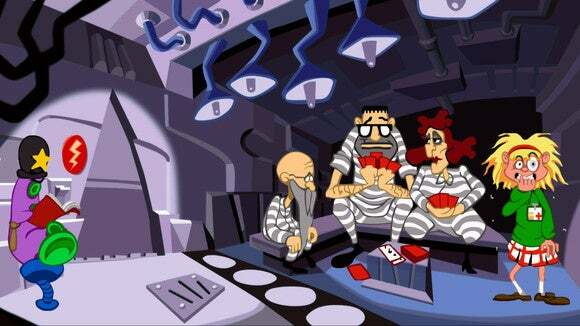 Take that puzzle and up the zaniness factor by a million—say, instead of you planting the tree you convince Johnny Appleseed to do it—and you’ll have a good idea of the puzzles in Day of the Tentacle. And for the most part, it works. Day of the Tentacle isn’t nearly as straightforward as most modern point-and-clicks, and this is LucasArts’s pun peak, but the game’s surprisingly decent at prodding you in the right direction. Plus you now have the ability to illuminate hotspots if you think you’re missing something obvious. Some of the puzzles though...oof. 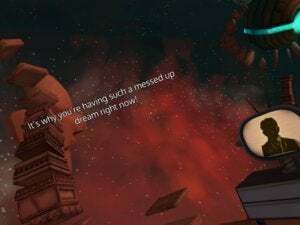 And Double Fine knows it. I’ve never seen a game more willing to poke fun at its own shortcomings as Day of the Tentacle Remastered. Achievements for certain puzzles are titled things like “Obvious, really” and “I forgot this is a cartoon”—tonally appropriate, but also seemingly indicators that Tim Schafer and Co. recognize the leaps in logic required by some of the game’s more ridiculous moments. There’s no way to fix it, of course. Or, rather, if it was “fixed” then Day of the Tentacle purists would rage until they sprouted arms and enslaved humanity. 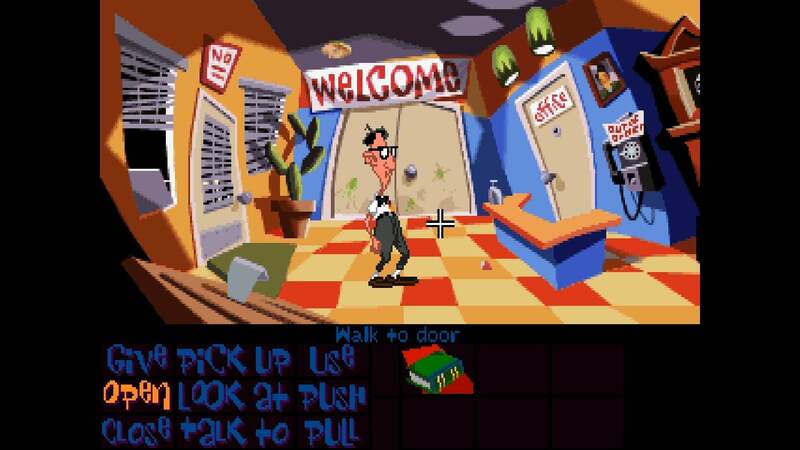 But keep it in mind if you’ve never played Day of the Tentacle before: This is most definitely an adventure game from the 90s. Brilliant, but don’t be afraid to look up a puzzle solution if you’re feeling frustrated. That’s not to say this is a one-to-one port of the 1993 original. 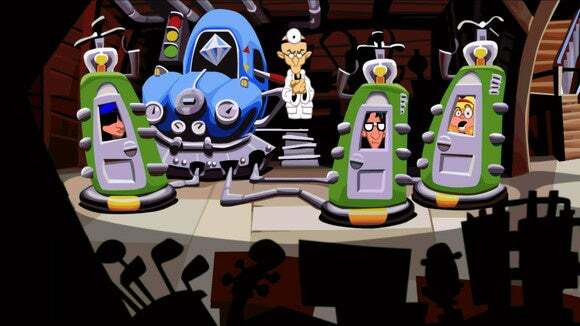 Like Grim Fandango, Day of the Tentacle has received the “Remastered” treatment and in this case Double Fine’s done some pretty extensive work. Most obvious is the art. The original’s pixel art has been, it seems, traced over frame by frame in a cleaner, more modern style. Thus you retain the weird (charming) herky-jerky animations of the pixel art but done up for 2016—all smooth lines and soft shading. Personally I like the pixel art (the bottom image) more, but that’s a subjective matter and anyhow you can cycle between both old and new by tapping F1. Which I did. A lot. Hitting F1 also swaps between the old and new music (chiptunes versus orchestration) and between the two verb (read: action) inputs. The old method is the classic LucasArts grid in the bottom left, which gives you a lot of freedom to try nonsense answers but necessitates a lot of mouse movement. The alternative is the more modern Dial interface, where right-clicking brings up a list of suggested verbs for each object and then you mouse over to choose. Best of all, you can mix and match the two Day of the Tentacle editions in the menu. I ended up running most of the game with the new art, the dial interface, and the old chiptune music—its off-kilter sound felt more faithful to the game’s tone. But you could choose any combination, which is a nice touch for 1993 purists and newcomers alike. The one caveat: You can’t highlight hotspots in the original pixel art. 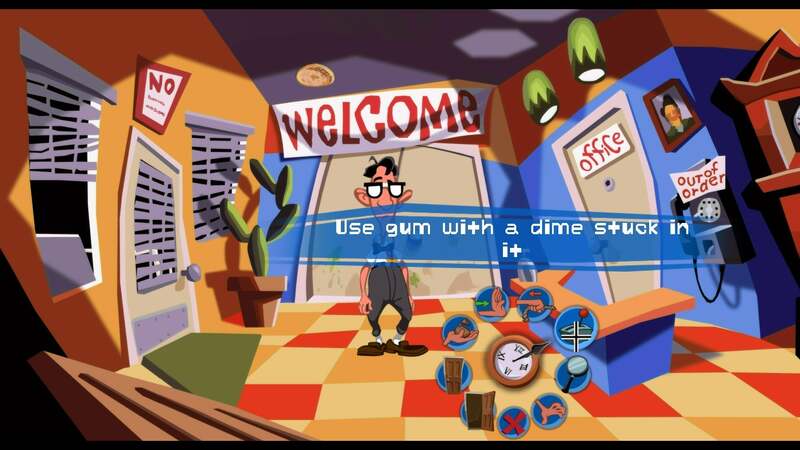 Day of the Tentacle is a classic, but not in the old musty way where you brush off a copy of some old SNES game and realize it isn’t as good as you remember. This is still one of the finest point-and-clicks ever made, with a witty story and some brain-bending puzzles. Also, a hell of a lot of dumb puns. 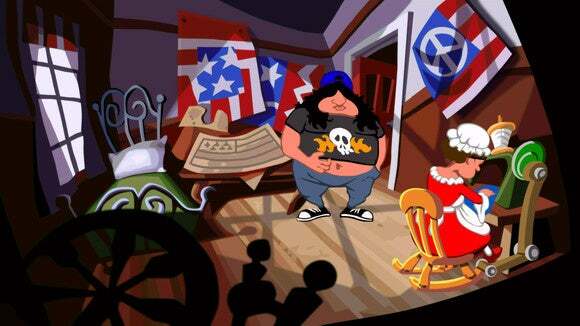 As with Grim Fandango, the big news is that Day of the Tentacle’s on sale at all. The fact that Double Fine’s put in so much work as caretaker to bring it up to modern—or at least mostly modern—standards? Even better. Day of the Tentacle may look new, but this is still the same ol' point-and-click people fell in love with in 1993. For better and for worse.